Help keep the library moving forward by becoming a library trustee! The Glencoe Caucus is seeking candidates for the Glencoe Public Library Board of Trustees. There will be four 4-year terms open for residents who would begin serving in May, 2013. Primary responsibilities of Library Trustees include creating written policies to govern library operations and programs; establishing and overseeing the annual budget, maintaining physical facilities; working with staff to evaluate the effectiveness of library operations, services and programs; employing an Executive Director; and promoting awareness of the library’s activities and services to the community. The Library Board regularly meets on the third Wednesday of the month at 7:30pm in the Hammond Room of the Library. Application forms for Library Trustee are available at the Reference Desk in the library and at the Caucus website. The library will be closed on Monday, September 3rd in celebration of Labor Day. We will reopen on Tuesday, September 4th. We will also reopen on Sundays from 1:00 to 5:00 beginning September 9th. As recent visitors will have noted, the library is using this quieter time in August to make some important facility improvements. We appreciate your accommodation as we re-carpet most of the first floor, stairways, mezzanine, and meeting room. The carpet crew is doing much of the work on Sundays when the library is closed, however, we will have to temporarily close some areas, one at a time. The YA/Media Room will be closed on August 20th and the Reference Room the following day in order to move the furniture and materials to carpet those areas. The Hammond Meeting Room was not reserved for use on August 27, so it will be closed for carpeting that day. After almost 20 years, it is also time to replace the burgundy wall coverings and a new color has been selected to go with the new carpet. Removal of the old fabric has already taken place during closed hours and the new green fabric will be installed on closed Sundays, August 12 and 19. Thank you for helping us expedite this work which should be completed by Labor Day. We are excited about the library’s fresh new look and hope that you will be, too. 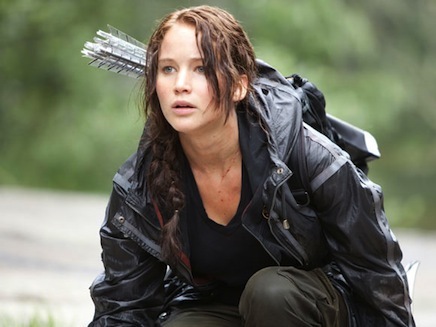 Get together with your friends at the library on Monday, August 20th at 6:00pm for a free showing of The Hunger Games! We'll provide the space and the popcorn and Katniss will provide the thrills! This program is for 6th - 12th graders only. The film is rated PG-13 and is 142 minutes long. This year’s From Page to Stage event will begin with a kickoff program and reception at 7:00 p.m. on Thursday, August 23, on the second floor of the Woman’s Library Club. This fall, five North Shore public libraries will present a series of programs related to the Writers’ Theatre production of Shakespeare’s Hamlet. Always a highlight among the From Page to Stage programs, this year’s kick-off will feature members of the Writers’ Theatre production. Coffee, dessert and more good conversation will follow the presentation. Our Children's Summer Reading Club is wrapping up and we're ready to party! Everyone who participated in the Reading Is So Delicious! summer reading club is invited to a pizza party on Saturday, August 4th at 12:00 noon to celebrate the end of another successful summer of reading. Join us at the library's backyard for pizza and fun!